There are only a handful of Twitter apps available for the iPad right now and none of them are anything close to being perfect. 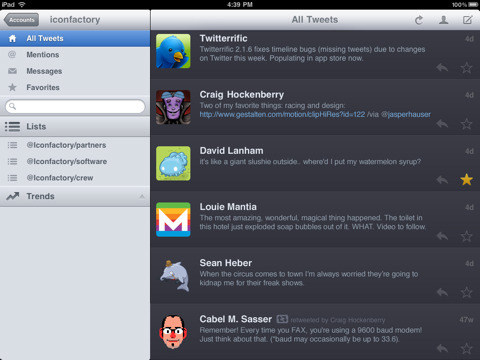 If you’ve got to pick one however Twitterrific is probably among the top 2 iPad apps. It has a clean interface that has actually been fully redesigned for the iPad and give you a pretty good selection of the features you’d want. Something that isn’t clear upfront is when you download the app for free is that if you want it to really work it’ll cost you $4.99 to get all the actual features to work. The iPhone version of Twitterrific has been out for a very long time and has won many awards. Having been created by the Iconfactory, Twitterrific for iPad has a sleek user interface and super clean graphics. Things are laid out with a meaningful and clean presentation that adjust smoothly when you rotate the iPad between landscape and portrait modes. Landscape mode adds a left pane that lists menu items for All Tweets, Mentions, Messages, and Favorites, along with a simple search box, saved searches, Lists, and finally Trends. This is really great for moving around the various sections of your account. Speaking of accounts, you can add multiple Twitter accounts to Twitterrific and flip through them in the paid version. Once you open the app, it tries to refresh your tweets automatically for you. In our tests the update fails periodically giving us an alert error stating “Twitter API Error”. Closing it out and tapping the refresh button manually fixes the issue, although this eventually becomes very annoying and should be fixed. You can write tweets, see profile information, shorten links, star tweets, reply, send DMs, forward to followers and more. Hashtags run auto-searches and URLs are opened in a handy internal web browser instance where you can optionally open the link in Safari, Email it or Copy the URL. You can follow, block, and view more user profile information in a mini-popup window for any tweet which is very handy. There is no support for uploading photo tweets internally. In the iPad settings section, you can toggle the Audio Notification chirp sound, and also show real names instead of usernames. Finally for those of you using Instapaper, you’ll be glad to have the built in support for sending opened websites to your linked Instapaper account from within Twitterrific on your iPad. Unfortunately however if you start clicking on links in the built in browser, your Instapaper content is still loaded from the first page you opened from the tweet and not your final destination. Overall, given the nice design and simplicity of the app Twitterrific is a good iPad twitter app that can be great if a few major bugs get sorted out. Let’s hope the developers release an update soon. AppSafari review of Twitterrific for iPad was written by Joe Seifi on May 10th, 2010 and categorized under App Store, Chat, iPad apps, Reading, Social, Utilities. Page viewed 5291 times, 1 so far today. Need help on using these apps? Please read the Help Page. Those two are the only difference in features between Free and In-App upgrade. So you don’t need to paid in order to get the one feature, multiple accounts. Regarding the “Twitter API Error”, our programmer worked with Apple engineers, and together identified a WiFi bug. So Apple is aware of the bug causing the error. And currently, out of our hand. Image upload is in version 1.1 along with other features and bug fixes, currently in review. Since most twitter user have one account anyway. They do not need to paid for the In-App upgrade.